The Moloch attack on Omega had unforeseen consequences damage to the facility set three strange creatures free. They are the product of a secret genetic research project, code named "Dancer". Now, half-mad and with no control over their instincts, creatures begin fighting for survival in the post-apocalyptic wasteland. 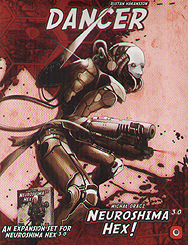 The Dancer is a completely new challenge for Neuroshima Hex players.